In this post, we took a look five of the best-selling glues. These dynamic adhesives can bond a diverse range of materials- scroll down to get an individual breakdown of their applications. 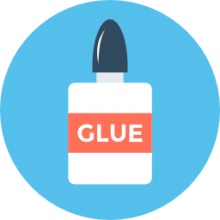 Glue is an adhesive designed to bond material pieces together- whether you’re a craft hobbyist or a DIY mechanic. There are several types of glue that can be used to bind: two-party epoxy glue, instant glue, and epoxy plastic bonder (Source). Glues work by a combination of adhesive and cohesive forces, which means the glue must stick to the pieces you want to hold together. Glues with high cohesive forces are tougher to pull apart (Source). Because plastics often dissolve when they come into contact with adhesives, you have to be careful when choosing the right glue. Experts say that when you have a project that requires the gluing of plastics, try model cement or a good vinyl adhesive (Source). In this article, we look at five glues that are ideal for attaching and repairing pieces of plastic. LocTite Super Glue is a two-step bonding system that’s guaranteed to repair any plastic according to the manufacturer. This adhesive doesn’t require any mixing and is formulated to work quickly. This glue is versatile and bonds leather, cork, paper, cardboard, wood, metal, ceramic, plastic and other materials. Users said the glue is strong and works ad advertised, but the small amount didn’t go too far. 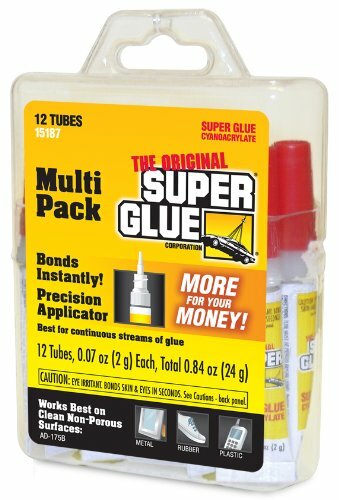 The Original Super Glue 12 pack gives you plenty of glue for those big projects with 12 2-gram tubes in the package in the reusable storage case. This glue sets quickly and is strong. Best used on non-porous surfaces such as metal, rubber, ceramics, plastics, and pottery. 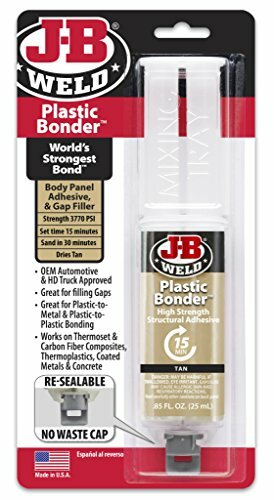 J-B Weld is a plastic bonder that comes in a syringe-like applicator. What sets this apart from the other glues we looked at is that it dries tan in color, which makes it ideal for filling in cracks on car bumpers and trim. This product is ideal for fiberglass, plastics, and other objects made from polyethylene or polypropylene. The adhesive has a tensile strength of 3770 PSI, which means it’s strong enough for most applications. Next is the LocTite Ultra Gel. This 4-gram tube is designed for bonding nearly anything you can think of including rubber, plastics, ceramics, wood, and metal. The tube allows you to squeeze from the sides, which gives you better control over the amount you distribute, and the gel means it doesn’t run. This product dries clear and sets quickly making it one of the better products we looked at. Last up is the Gorilla Super Glue. This glue is also a gel, which means it doesn’t run making it ideal for use on vertical surfaces. Like the LocTite, this glue is extremely versatile and is able to bond a multitude of surfaces. It sets up quickly in about thirty seconds and provides for a strong, impact-resistant bond. What’s nice about this product is that it has an anti-clog cap, which means it’s less likely to dry out between uses. This super adhesive gel offered by Gorilla is convenient, easy to use, and suitable for plastic, wood, metal, rubber, ceramic, paper, and more. Users love the price and quality, but some do note that it’s not as thick as they expected. The Gorilla glue gel has a special run control formula, which makes it great for vertical surfaces and unique rubber particles, which increase strength and resistance. Another excellent thing about this product is that it dries in 10-30 seconds with no clamping required on your part. In addition to this, it has an anti-clog cap, which prevents the adhesive from drying out. 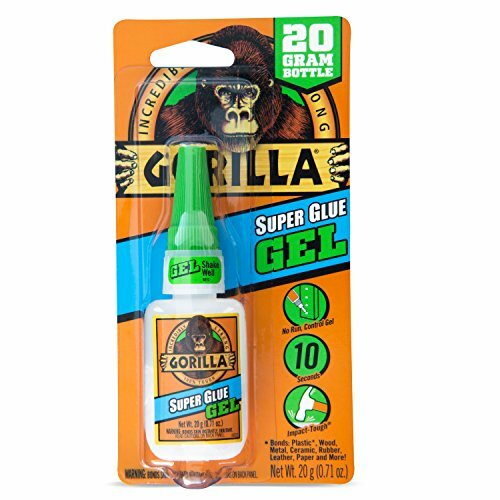 In general, users are satisfied with the performance and usefulness of the Gorilla super gel, and they highly recommend it as one of the best glues for plastic. A reviewer comments that the product doesn’t run all over the place and that you won’t glue your fingers accidentally. He adds that you don’t have to hold it in place to dry and that the gel works wonderfully on ceramic. Another buyer mentions that the gel doesn’t harden inside the bottle and that it does the job fast. A purchaser also shares that he used the gel to mend a picture and it’s holding up pretty well after a couple of weeks. However, a couple of customers have complained that the glue doesn’t work as well as they expected and that they received a bottle half full. Some also point out that it hardens in the bottle too quickly. 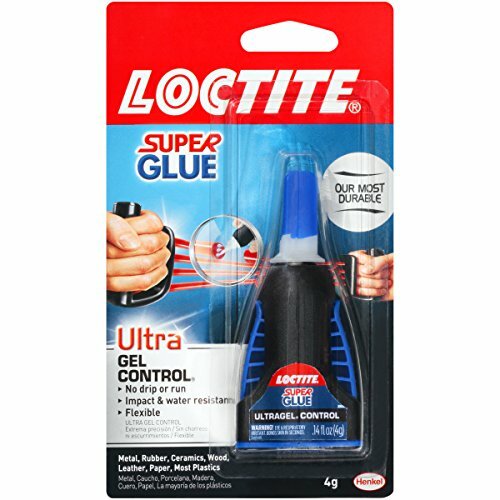 If you are searching for versatile glues to mend household items, you might take a look at this ultra-gel offered by Loctite. Users love the specialized rubber toughened formula, but some do note that the quantity inside the bottle is insufficient. The Loctite super glues feature a side squeeze design to improve control and dispensation, a formula that withstands temperature extremes, vibrations, and shocks, and it’s suitable for metal, plastic, rubber, wood, to name a few. Another great thing about this product is that it dries quickly, and it’s perfect for vertical surfaces. What’s more, you don’t have to apply pressure to bond things. A reviewer comments that he is very pleased by the strength of the Loctite super gel and that it’s one of the best glues for plastic that he has ever used. He mentions that he likes the design of the bottle because it’s easy to squeeze the right amount of gel. Another reviewer states that the product is good to go even after months of no use and that he highly recommends it. A user also shares he is amazed how quickly it dries and that it leaves no mess thanks to the bottle design. He adds that application is a piece of cake and that it’s great for delicate work. However, a couple of customers have complained that the glue dries inside the bottle and that you’d need several packages if you want to mend even small objects. This plastic adhesive syringe offered by J-B Weld is well-designed, strong, permanent, and it’s suitable for plastic and fiberglass. Users love that it’s made in the USA, but some do note that they expected better results. The J-B Weld plastic glue is a two-part urethane bonder, and it features a tensile strength of 3770 PSI, which is great if you’re looking for a permanent bond, and a re-sealable no-waste cap so that the adhesive won’t dry or make a mess. Another excellent thing about this product is that it dries in 15 minutes and cures in 30. As a whole, reviewers are satisfied with the quality and strength of the J-B Weld adhesive syringe, and they highly recommend it as one of the best glues for plastics. A user mentions that he used it to repair his scooter and that it’s still holding after a couple of months. He adds that it’s one of the strongest glues he has ever used. Another reviewer mentions that he has used it on multiple surfaces and that you might have to wait 24 hours for the bond to become permanent instead of 30 minutes. A user also shares that J-B Weld glues are the best for repairs and that application is easy. However, a couple of customers complain that the product doesn’t hold as long as they expected it even when they follow the instructions to the letter. Some also point out that it’s not suitable for HDPE. If you’re wondering how to fix broken glass, you might try this super adhesive offered by Super Glue. Users love the price, but some do note that the consistency is waterier than they expected and it’s difficult to squeeze without making a mess. The adhesive comes in a package of 12 2-gram tubes, which feature the original formula of Super Glue, and it works best with a non-porous surface, for example, metal and rubber. Another great thing about this product is that it comes in a reusable storage case so that you can keep it away from children and prevent spills. What’s more, the glue sets quickly, and it’s easy to apply. A user mentions that he is very happy with the super adhesive and that he has used in on plastic with excellent results. He adds that the 2-gram bottles are convenient because you can use them one at a time and that you don’t have to worry about the rest of the glue will harden. Another reviewer mentions that it’s far stronger than he initially expected and that he glued his fingers accidentally. A purchaser also states that you can use a tube repeatedly and that the cap won’t get fused. However, a couple of customers have warned that the package is hard to open and that they had to spend over 20 minutes figuring how to do it. Some also point out that the bottles leak. This plastic bonding system offered by Loctite is useful, convenient, and available in a single package, a six pack or a 12 pack. Users love the price, but some do note that they expected more quantity in the bottle. 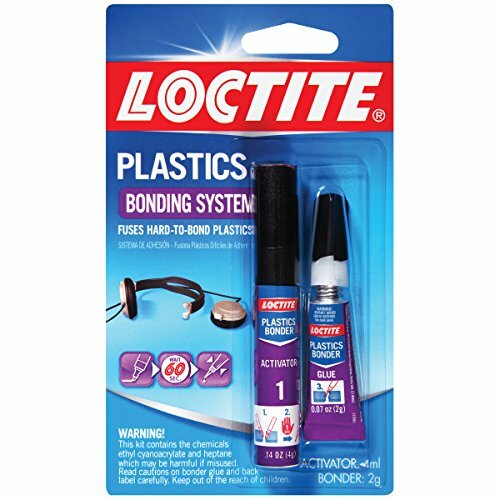 The Loctite super glues feature a 2-gram tube of bonder with an activator, which is suitable for bonding various materials like cork, paper, wood, hard plastic, including Plexiglas, polystyrene, polycarbonate, and PVC. Another great thing is that it’s easy to apply with no mixing required. What’s more, it sets in minutes and the manufacturer guarantees that it will repair any plastic. In general, users have a favorable opinion of the Loctite product, and they highly recommend it as one of the best glues for plastic. A buyer states that he is impressed with the results and that if you’re not careful, you might stick your fingers together. He adds that he used it to mend a laptop stand and that it’s holding as good as new. Another purchaser mentions that it’s your best choice for hard plastic and that it dries without leaving traces. A user also states that it bonds securely and that it hardens almost instantly. However, a couple of customers have pointed out that the gel hardens inside the bottle far quicker than they expected. Some also complain that they received an empty bottle. In this video the creator discusses how to get super glue off of your skin without acetone. Now, if you have heard of the acetone method, you are taking a cotton wool ball or a cotton swab, and you put some acetone on, then you take the affected region and you rub the cotton swab onto your skin and sooner or later it will come off. Even though that method works you may not have acetone so in this video he demonstrates how to use some household things, such as razor shaving cream and some water to get that super glue right off your skin. Now, at the start of the video, they don't have superglue on their skin. So the YouTuber actually puts some on for demonstration purposes. If you can see the shininess, in the video the glue has dried up, and he uses a razor blade to scrape it off. It is a very generic razor blade there. The beauty of this is it is created to get close to your skin without actually removing the skin. So this will continue to work really well for your our needs. With superglue, what you do is you get your own razor blade kind of wet. This can help things go smoother and optional is some shaving cream- they find that it works best. By doing this, what they're going to do is take the shaving cream, put it on your skin. Now you take the razor blade and you just go over the area also keep in mind the whole idea with the razor blade is that it is going to cut it off instead of attempting to make it dissolve or anything like that, and it permits you to get close without actually removing your skin or something like that, so once the majority of it is off now they are going to wipe their own hand off. He provides a close-up and shows how he lubricates with some lotion to soothe the skin afterwards- this isn't necessarily required. They are just doing that since they don't know how chapped the skin is going to get. You might not get it all off and and the acetone might work better, but if you don't have any, this certainly does an excellent job. Hopefully the logic is clear to you: you're using something that's developed to specifically get close to your skin without cutting off any skin, and you know doesn't cost you much. This can be a cheap solution. The the easy way go with superglue is to wear some gloves or something like that- particularly a latex pair. Nothing is more frustrating than to have a glue joint fail, especially soon after you have glued something up. Most glue joint failures are foreseeable and there is some sound shop practices which will reduce this problem. They check out a few of them saying that, typically, woodworkers used hide glue which will come in crystalline form and it has to be dissolved in water and kept warm throughout the application. Because of this it is typically grown out of use. Today, woodworkers rely mainly on PVA glue- while the man on the street may think of PVA as indicating any water-based glue, it really means polyvinyl acetate. It has been around for some time, but typically it was only good for interior use. Within the last 10 years, the YouTuber explains, he's seen developments in the chemistry of PVA glues such that they are now waterproof and he has even some that have a longer open time, which is great when you have an elaborate assembly. They check out some other factors that affect a glue joints ultimate strength. The surface of the wood in any glue joint is essential. The smoother the better. Whether through sanding or through planing, a great trick for gluing two boards together is to fold them up like a book and now either take them to the jointer as a pair or clamp them in your bench as a pair. And now taking a jointer plane- plane them end to end until you get a continuous full width. No matter whether your jointer was not dead square or your plane wasn't quite dead square since alternate interior angles are equal. When he opens it up and glues them together, this will be a dead flat pane. A frequently overlooked detail in glue ups is application. It should be to both surfaces and uniform and thicknesses some tools that will help us with this are inexpensive paint brushes. Another tool is a small rubber roller, frequently called a brayer that you can get at any hobby shop. They can now take the brayer and just roll that glue out, and they have a complete and uniform application with a constant thickness to the glue. They now merely line these parts up, put some clamps on them and let them dry. A great trick is to write the time of the glue up down so you are aware for sure when the glue is dry enough to use. One more thing is to keep a nice damp sponge handy. Your shop needs to be about 65 to 70 degrees Fahrenheit- because many chemical reactions, glue being one of them, either double or have in speed for every 10 degrees centigrade, which is 18 degrees Fahrenheit. An extremely cold shop will cause the glue to dry very slowly or incompletely. Conversely, a hot shop will cause glue to dry too fast. If, like the YouTuber, you reside in a northern climate and have a shop that's really chilly in the winter- there are some techniques you should use. The first is a simple heat lamp- you use it by shining it on the pieces you have, just glued. It'll bring the temperature up enough to have the glue set in the normal amount of time. Some other essential things to consider when choosing a PVA glue are waterproofness and open time for they cabinet work. And there you go- some application tips!